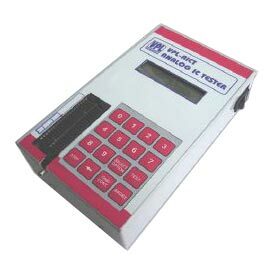 We are a major Exporter and Supplier of VPL IC Tester (AICT). VPL IC Tester (AICT) tests most of the ICs in DIP package. The list includes operational amplifiers, voltage, comparators, transistor arrays, optocouplers, analog switches, voltage followers, timers, A to D converters, D to A converters and miscellaneous analog ICs. Tests most of the ICs in DIP package. The list includes Operational amplifiers, voltage comparators, transistor arrays, optocouplers, analog switches, voltage followers, timers, A to D converters, D to A converters and miscellaneous analog ICs. Digital Display to show IC number, PASS & FAIL Status, Operations display. It has 12/16 keys for its operation. Audio alarm to user whenever it is required.